As with any health condition these days, it is so hard to know what to do. There are thousands of people on the internet offering their advice (myself included) and it's hard to know what is good advice and what actually might do more harm than good. Of course you should work with your healthcare provider to understand what course of treatment is best for you, but for many people that involves just getting a prescription (which may be necessary), but doesn't always take into account the big picture, or help you get rid of all your symptoms. As a nurse practitioner, I see a lot of patients with hypothyroidism. But as someone who takes a functional medicine approach, I also understand that hypothyroidism doesn't start and end with the thyroid. All of the systems in your body are connected and they all affect each other, so when one isn't functioning properly, there are others that are also affected. Thinking that "normal" lab results mean you're fine. Based on research, we know that your TSH should be less than 2.5. But beyond that, the TSH is an unreliable test of thyroid function in the first place. Your TSH does increase as your thyroid function decreases, but there are other factors (such as stress) that can cause your TSH to be low or "within normal limits" while your thyroid function may not be optimal. Taking medication for your thyroid can also artificially suppress your TSH. So if you are already being treated for hypothyroid but you are only having your TSH tested to determine if you are on the right dosage of medication, you may not be getting the right dose. If you have not had all of your thyroid hormones tested, that is truly the only way to get the full picture of what is happening with this important endocrine gland. This post lists the full panel of testing that you should have done by your healthcare provider. It's also important to note that "normal" or "within normal limits" is very different from optimal. The ranges used to determine "normal" are based on an average so they also include people who have diagnosed and undiagnosed thyroid disease (up to 50% of people with thyroid disease are misdiagnosed or undiagnosed) so normal may be far from optimal. It's worth it to work with a practitioner who understands what optimal levels are. Of course your thyroid is a big part of hypothyroidism. But, in functional medicine we aim to find the root cause of something, so understanding what could be the root cause of your hypothyroidism can go a long way in helping to get you on the road to recovery. When it comes to hypothyroidism (or any problem with the thyroid) you need to take a look at the whole pathway. Thyroid hormones are part of a complex pathway that has many steps where things can go wrong. It's important to figure out if the problem is with the thyroid not being able to release hormones, the thyroid not being able to convert the inactive hormone into the active hormone, or the hormone not getting where it needs to go. This is why many people continue to struggle even once they are on thyroid replacement, because the problem is not always that your body isn't making enough hormone. This is also why it’s critical that you get a complete thyroid panel because you need all of the information to figure out where the problem is. Estrogen (either from excess estrogen or hormone replacement therapy) can also interfere with thyroid hormones. This make it look like your thyroid is the problem, when really it's not the root cause. Most people who have adrenal fatigue actually have elevated cortisol levels, not low cortisol. Elevated cortisol can decrease the conversion of T4 (the inactive form of thyroid hormone) to T3 (the active form of thyroid hormone) and decreases TSH production which suppresses thyroid function. Studies do show that T4 and T3 can help to protect the intestinal lining from ulcers  as well as that hypothyroidism can contribute to increased intestinal permeability. Gut bacteria also help to convert T4 into T3. Almost 20% of T4 conversion to T3 occurs in the gut. Hypothyroidism can also contribute to low stomach acid, but low stomach acid contributes to hypothyroidism as well. The digestive issues that occur with low stomach acid also contribute to autoimmune disease, chronic stress, and poor nutrient absorption, which can all lead to hypothyroidism. You can see that this may be a tricky cycle to break, hypothyroidism affects gut function but gut function also affects levels of active thyroid hormones in your body. Either way, improving gut function may help you to improve your thyroid health. Iodine supplementation for thyroid health is somewhat of a controversial topic. There are many practitioners out there who believe that all hypothyroidism stems from iodine deficiency. But it's important to understand that too much iodine can also suppress your thyroid. However, it seems that iodine is only an issue for people with thyroid disease if there is concurrent selenium deficiency. In a study done on rats that developed a goiter when receiving excess iodine, when they are given adequate amounts of selenium, they did not develop a goiter. 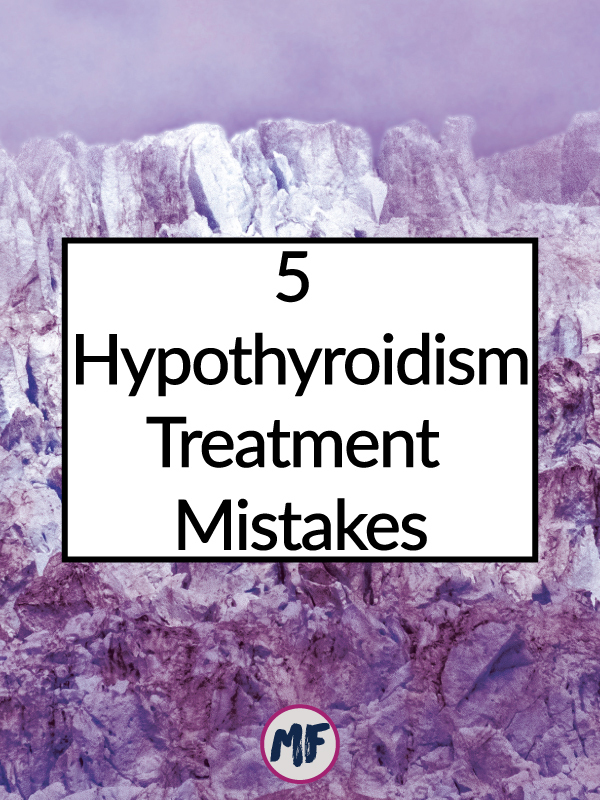 Obviously, being aware that these common pitfalls exist when working on a hypothyroidism treatment plan is a great first step in avoiding them. But the problem is that simply being aware of them doesn't necessarily mean that they are easy to avoid. I think making sure that you are working with a healthcare practitioner (either in person or online) who you trust and who understands the complexities of thyroid conditions is critical. It's also important that you find someone to work with who you trust, because so often our (well intentioned) healthcare practitioners make patients who are insistent that something is wrong even though nothing appears wrong, feel like they are crazy. If you don't feel like you are getting what you need out of your hypothyroidism treatment plan, it's definitely worth it to voice your concerns, or search for a new practitioner. I know that's not an easy task, but being told that there's nothing wrong with you even though you still don't feel great is not an option in my book. I've had my own experience with this. I was told over and over again that my labs were fine and there was nothing wrong with me and I must be making it up. Months later I found out that I had a reactivated mononucleosis infection...that's not nothing. Everyone was just looking at all the wrong things. But I had to find a practitioner who actually listened to the story I was telling her rather than trying to fit me into a box where one of two of my symptoms fit nicely. So I encourage you to stand up for yourself and ask for what you need form your healthcare practitioner. If they are unwilling to help you out, I encourage you to being the process of finding someone who is willing to help you find the answers you need.